When racial antagonism seized the University’s campus in the late 1960s, a surprising but familiar setting served as the primary battleground: the pages of The Argus. Starting with the release of a controversial yearbook in 1968, tensions between the predominantly white student body and the school’s growing Black population escalated, rising to a fever pitch as the decade drew to a close. Throughout the process, grievances were aired—and tempers stoked—in The Argus, fundamentally altering the conflict and establishing the precedent for The Argus’ coverage of racial conflicts for years to come. Some students clearly agreed. Later that month, twelve Black students from the Afro-American Society took to the steps of North College and burned four copies of the 1968 Olla Podrida. The Argus reported that while the demonstrators were calm and amiable (“did anyone bring any marshmallows?”), white onlookers were agitated (“they’re burning your college down”). The fall semester wound to a close without any satisfying resolution to the divisive incident, and tensions lingered as the calendar year turned. 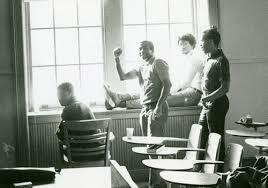 Four months later, on the anniversary of Malcolm X’s death, about 100 Black students occupied Fisk Hall. Protesters held the specific grievance that President Edwin Etherington ’48 would not declare it a University holiday, but also the broader complaint that the administration had consistently chosen to placate, rather than meaningfully engage with, the demands of Black students. In one sense, the protest was successful: the John Wesley House was shortly thereafter converted into the Malcolm X House, which today remains a staple of campus residential life. But many white students and faculty remained unconvinced. The Argus quickly found space for these oppositional perspectives, while initially failing to make room for either Black or allied voices. In the next issue, on Feb. 25, The Argus ran an opinion column (which, unlike Letters to the Editor, is vetted by the editorial staff) that described the protesters with phrases like “demagogues” and “interested exclusively in the exercise of power and a confrontation.” Coverage of Etherington’s loosely complimentary—albeit unsubstantial—remarks about the incident represented the only Argus-sponsored defense of the occupation. In the subsequent weeks, Letters to the Editor hosted a lively ideological battle between opposing voices. Alan Segal ’70 and Peter Gibson ’72 sparred over authoritarianism and tone-policing, others escalated the debate, and tensions rose over the backdrop of James Earl Ray’s trial for the assassination of Dr. Martin Luther King Jr. The University’s racial Cold War would walk its tightrope of strained civility, until the fall. When a string of dormitory burglaries broke out in the fall of 1969, white students openly suspected and accused their Black peers—an exceedingly predictable and commonplace outcome that seemingly ruffled no feathers in either community. When two Black students entered the dorm room of a white student, however, the seal broke. The Black students claimed to have been looking for the bathroom, but the white resident called larceny. When the confrontation escalated and a mob of white students joined the scene, one of the Black men, George Walker ’72, pulled out a knife—whether to attack or to defend was later disputed. Though no physical injuries were ultimately sustained, the Student Judicial Board (SJB) put both Black students on academic probation while giving the white student an “official warning.” This may strike the observer as a favorable outcome for the white student. But many—most infamously, Jonathan Berg ’71—disagreed. But the biggest oppositional voices, ultimately, were those of Walker himself and classmate Kwasi Kibuyu ’71. After Berg declined their demands to retract his statements, the pair went to Berg’s dorm, where Walker physically assaulted him. Walker was quickly expelled, and a suspension for Kibuyu followed shortly afterward. Nobody seemed to dispute Walker’s punishment, but outrage was intense and immediate over the punishment for Kibuyu, who had apparently done nothing but be a bystander to his friend’s violence. Over the coming weeks, The Argus played stage to public theater. Proceedings that would be kept confidential today were broadcast in bold, size 24 letters. The Student Advisory Committee, Ujaama, the SJB, and even Etherington all offered their takes in the form of Letters to the Editor. Kibuyu, outspoken in his own defense and against institutional racism throughout the process, was all at once ostracized, vilified, and martyrized. But it was Berg who was to become the ultimate martyr. On Nov. 19, two weeks after Walker’s attack on Berg, a fire was started at Berg’s Lawn Ave. apartment. The junior, who was home at the time, jumped to safety from his second-story window and no residents were harmed, but the intent was clear. Another two weeks after that, University administrator Rhahim Khabib was hosting three other Black people in his apartment when bullets shattered his window, narrowly missing him. A conflict which had previously been primarily ideological was suddenly and startlingly violent. Paranoia now ruled the University. The threat of another attack loomed large, and when the mania became too much, one was manufactured. The University received calls claiming that bombs had been planted in the basement of the new Malcolm X House by militant racists. Meanwhile, white students brushed off this threat and instead insisted that the school investigate an alleged stockpile of assault weapons elsewhere in X House. Neither existed. This, of course, was far from the end of racism at the University, but the no-longer-Cold War de-escalated soon thereafter. There is certainly still a racial divide on campus—to pretend that this marked the end of white-Black conflict at the University would be wildly disingenuous—but the ’60s stigma against interracial fraternization has dissipated. Yet, Leticia Pineiro ’88’s quote from 30 years ago still rings true today. Perhaps this is the key lesson for University journalists to keep in mind. On the other hand, it seems clear that journalism can spark conflicts of this nature, but can’t solve them. This was true in the 1960s, it was true when The Argus ran “No Indians at Wes Next Year” in 1974, and it was clearly true during 2015’s “Why Black Lives Matter Isn’t What You Think” controversy. Avoiding the mistakes of the ’60s while continuing to amplify minority voices is a critically important task, but it’s one at which The Argus hasn’t always succeeded. Sam Prescott can be reached at sprescott01@wesleyan.edu and on Twitter @sam_prescott16.